Generously butter a 11x7x2inch pan and set aside. In a medium sauce pan pour 3 cups of water. Crumble up bouillon cubes with your fingers into water and then stir water a few times with spoon, next pour in the rice and stir. Bring the water to a boil, once the water has boiled put the lid on the pot and turn down the heat to medium low. Allow this to cook for 25-30 minutes. While the rice is cooking melt 4 tablespoons of butter in a large frying pan over medium-low heat. Next add the garlic and cook till fragrant. Turn the heat up to medium and gradually mix in flour. Stir in red and black pepper to taste. Do not salt this, the cooked rice and cheese will add much flavor! Cook the flour mixture till nice and bubbly. Next pour milk slowly into flour mixture while continually mixing with whisk. Next add mustard and cheddar cheese and continue to constantly stir. The mixture will become bubbly, smooth, and thick, set aside. 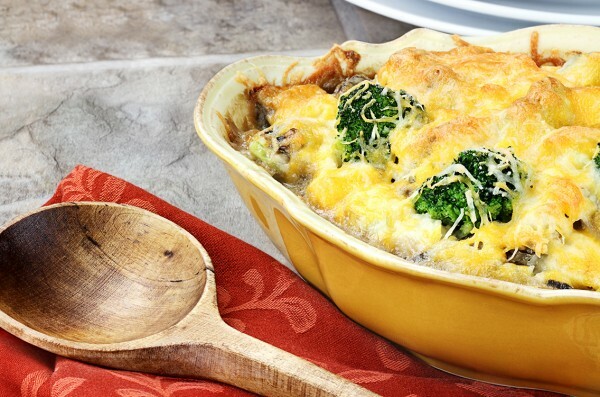 When the rice is done, fluff with fork and stir in 2 cups of it along with the broccoli into cheese mixture. If you want to add the rest of the rice you can, or do not add it if you prefer casseroles a little on the creamy side. Once the rice and broccoli are mixed well with the cheese sauce pour into buttered dish and sprinkle with parmesan cheese. Bake in the oven at 400 degrees for 25-30 minutes until brown and bubbly on top and edges. After baking let it sit for 5 minutes before eating.